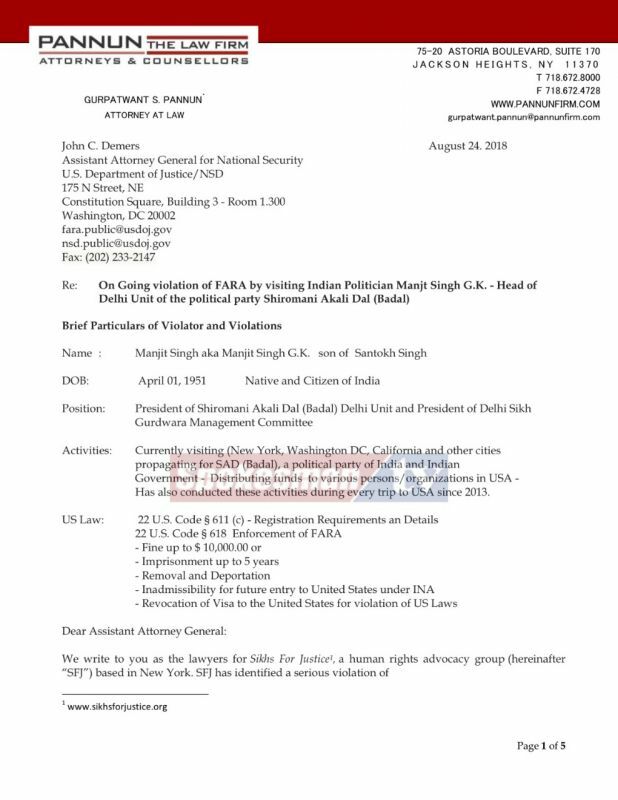 Rights group “Sikhs For Justice” (SFJ) filed a complaint with US Department of Justice against visiting Indian politician Manjit Singh GK for holding, attending and addressing political gatherings in the USA in violations of Foreign Agent Registration Act (FARA). 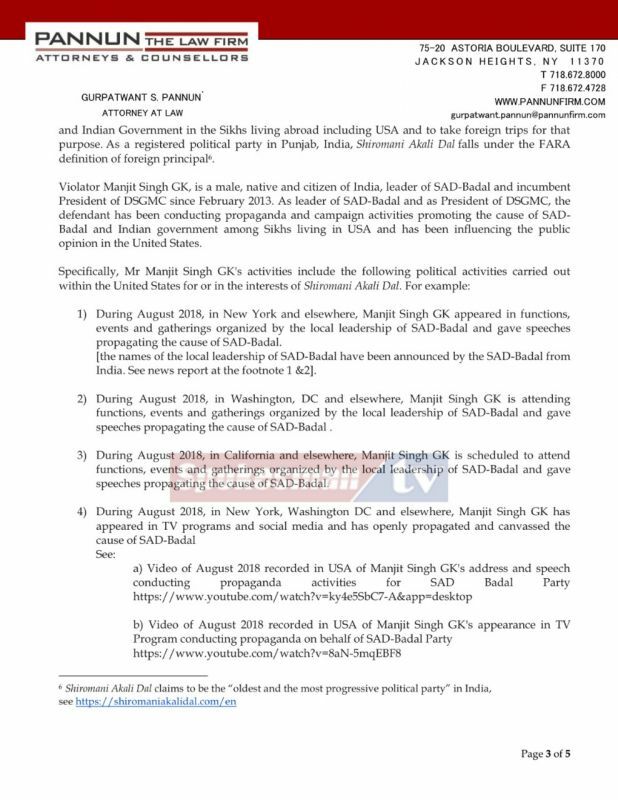 Manjit Singh GK who is the head of SAD-Badal Delhi Unit is on a visit to USA to promote and propagate SAD's cause among Sikh diaspora. Foreign Agent Registration Act (FARA) of the United States requires every foreigner speaking or propagating on behalf of a foreign political party or entity to register himself with the US Department of Justice FARA Division and submit all the papers and information that he intends to disseminate in the United States. 5 Page FARA Violation complaint Assistant Attorney General for National Security lists GK's activities along with documentary evidence of violations. Under FARA failure to register or submit the documents as required by law could result in USD 10,000.00 fine or up to 5 years of imprisonment and deportation from the United States. 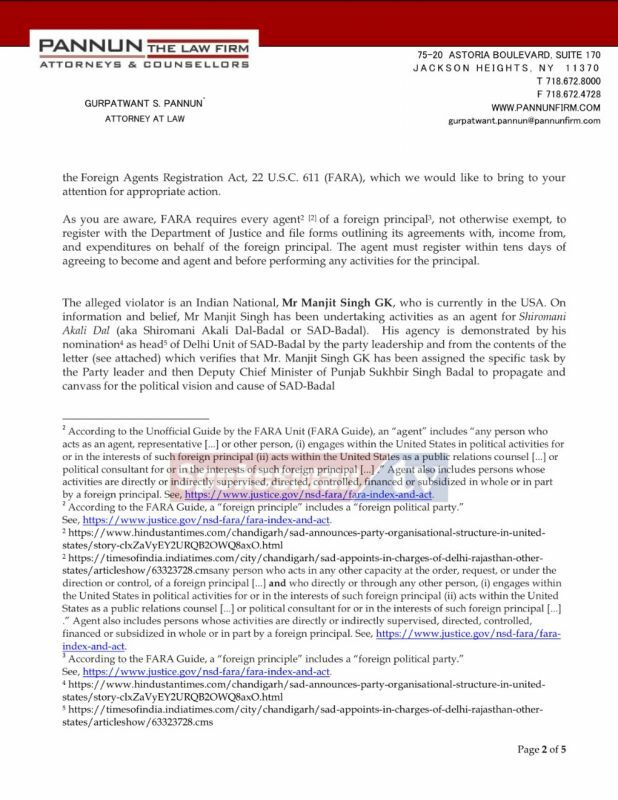 According to attorney Gurpatwant Singh Pannun, legal advisor to SFJ "We have brought the GK's violations of FARA law to the attention of Assistant Attorney General for National Security who is responsible for investigating and enforcing the FARA violations".